In Western Australia, our workplaces are protected by The Occupational Safety and Health Act 1984 (OSH Act) which requires electrical equipment to be safe and not expose workers to electrical hazards. Occupational Safety and Health Regulations 1996 (the OSH regulations) stipulates the manager or person who has control of your workplace must make certain that all plug in portable electrical equipment and RCD’s are safe and regularly tested and inspected. This equipment needs to be tested at intervals depending on its class of work. These can be divided into two main areas Construction, as required by AS/NZS 3012, and for office, service, manufacturing, amusement, rural industry work, and all other workplaces — require a risk management approach to determine the type of inspection and if necessary any testing required. How this affects you and your workplace safety is that you should be aware that regular testing and tagging of portable plug in electrical equipment, and testing RCD’s and recording of these results is required. Determining when testing is required is fairly easy. If you’re on a construction site you should be testing and tagging all equipment every three months as a minimum. RCD’s tests must be carried out in accordance with the requirements of AS/NZS 3012:2003 and each test result must be recorded. For other locations from industry standards we have found that if the equipment is high use then your testing regime should reflect the same. In general office, testing is performed every 12 months on portable plug in equipment; RCD’s a minimum of every 6 months. For hire companies on the other hand these are tested usually as they leave to each job, or a minimum of quarterly. Best advice is to make a risk assessment of your safety and put your planning in place before accidents may occur. PRF Electrical are qualified to provide ALL testing and tagging, we use a superior high end PAT (portable appliance tester) which digitally records each test, and prints a barcoded tag which can be scanned for ongoing testing thus producing accurate results for each appliance. 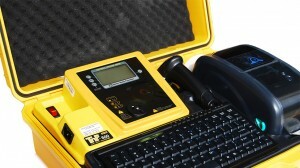 Records are required to be kept and you may be asked to produce them by a Worksafe inspector. We provide your records in digital format which is acceptable, but you can also easily print these as a hard copy. Different colours of tags identify the different time interval between testing of equipment. In Western Australia we use; RED for December to February, GREEN March to May, BLUE June to August, YELLOW September to November. BLACK is 12 monthly and ORANGE & WHITE 6 monthly. The electricians at PRF Electrical are fully qualified and conversant with the standards and regulations. 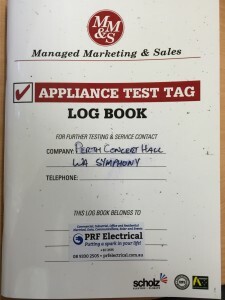 For further information or to make a booking for your tests please contact us at www.prfelectrical.com.au or info@prfelectrical.com.au or call 9330 2505.